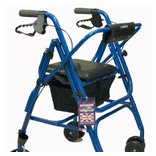 Choose from the British made Uniscan range of wheeled three wheeled and four wheeled walkers, all with seats and slowing brakes. Uniscan are of British manufacture and finished to a very high standard and in a range of colours. 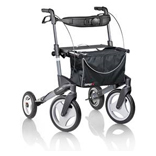 Or competitively priced three and four wheeled walkers with shopping carrier and easy-to-operate slowing brakes. Improve indoor safety and mobility with trolleys designed to assist with walking and for carrying items, from the stylish &grave;Lets Go´ with squeeze handle slowing brake to a more traditional tubular trolley with two shelves. The off-roader – a practical rollator for an active outdoor life. 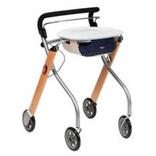 The TOPRO Olympos is a premium rollator specially designed for outdoor use. It is made of materials which can withstand any kind of weather and has large front wheels to ensure a smooth ride on uneven and stony surfaces. Height adjustable handles, an integral seat with spacious bag, the Olympos is ideal for taking on days out. It is easy to fold together and transport by car, plane or train. The most popular model, which features adjustable handle height. Lightweight and strong, folds flat and stands for unsupported storage. It has a folding seat with a comfortable integral padded backrest for a secure seating position. Walking stick holder and shopping caddy with cover. Choice of colour and accessories and braking systems. The Triumph Tri-Walker is a totally unique concept. As well as the standard features it is the first lightweight tri-walker to include a folding seat. Lightweight but surprisingly strong. 'One Touch' Locking Lever Brakes and three sets of double wheels. Front swivel for easy manoeuvring and rear for stability. Soft grip handles and integral shopping holdall, which simply folds neatly with the folding action of the walker. 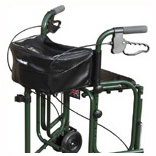 The Three-Wheeled Rollator is extremely durable making it ideal for everyday use. Excellent value for money, it features either easy to operate loop brakes, which provide secure stopping and lock into place for security, or pressure brakes. Height adjustable handles ensure the correct position for the user. Note: A four wheeled rollator is recommended for people whose balance is not so good. It folds easily for transportation and storage and will remain upright when in folded position.The rollator comes complete with a handy zippered carry bag and large basket with trey. The bag can be left in place when the rollator is folded. The sturdy steel frame is available in two attractive colours, Ruby and Quartz. Handle height adjustable from 32" to 38". Wheel diameter 8". Overall width 25¼". Weight 8kg. User can brake both wheels with one hand! 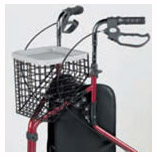 Comfortable soft handle can be adjusted to suit height of the user. Comes with carry bag and clip on tray. Easy to use and ideal for indoor use at a home, care home or hospital. Comes in Wood grain, Silver or Red.